Of the various themes on which online slot machines are based, one of the best is surely ancient gods, whether they be Roman, Greek or in this case Norse. 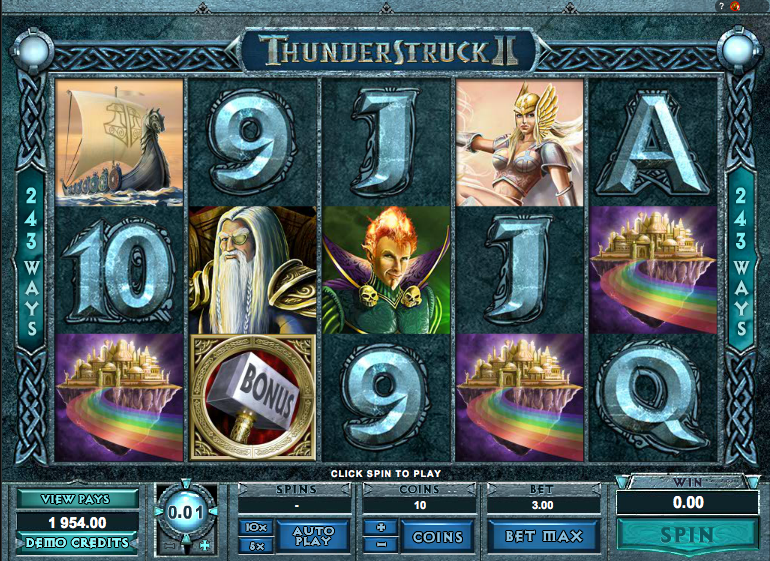 Microgaming have now produced a sequel to the ever popular Thunderstruck slot which features bonus features galore and all new graphics. This game has five reels and an impressive 243 ways to win rather then the standard paylines; the design is warrior-like and severe and all the playing card symbols look like stone carvings to tie in with the general ambiance. The other symbols are all theme-related so we have a Viking longship, the home of the Gods – Valhalla, Valkyrie, Loki, Odin and Thor. Thor’s hammer is the scatter symbol and the Thunderstruck 2 logo is the wild. This is a randomly occurring feature and if you are lucky enough to earn it up to five reels can be turned completely wild. There are so many possible winning combinations because symbols can win from left to right and right to left and as long as they are on adjacent reels, that’s Ok.
Loki from 5th trigger – 15 free spins + Wild Magic symbol on reel three which randomly transforms symbols into wilds. Landing more Thor’s Hammers will add more free spins. Odin from 10th trigger – 20 free spins + raven feature which randomly turns symbols into 2x and 3x multipliers. Both ravens earn a 6x multiplier. Thor from 15th trigger – 25 free spins with rolling reels which increase the multiplier by 1x with every consecutive win. Free spins can be re-triggered while playing the Great Hall of Spins. This is worthy sequel to Thunderstruck and there’s a real temptation to keep playing to try and work your way up the Great Hall of Spins ladder. The graphics are appealing, as are the sound effects. The paylines are fixed so the minimum bet per spin is €0.30 but if you’re feeling flush you can splash out up to €15.00 per spin.